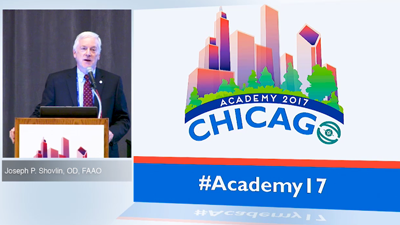 This rapid-fire session provides a quick overview of the 20 most news-worthy scientific presentations and new product launches from Academy 2018 San Antonio. 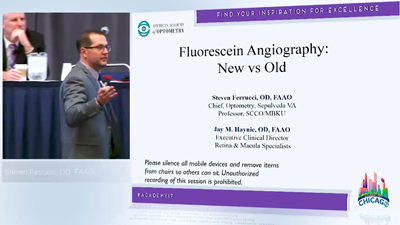 This course will look at the differences between new OCT angiography and traditional, dye-based fluorescein angiography. Strengths and weaknesses of each procedure will be highlighted, with case examples used to strengthen key points. Dr. Steven Ferrucci is currently Chief of Optometry at the Sepulveda VA Ambulatory Care Center and Nursing Home, and a Professor at the Southern California College of Optometry/Marshall B. Ketchum University. He is a fellow in both the American Academy of Optometry and the Optometric Retinal Society, and currently serves as Vice-President of the ORS. Dr. Jay M. Haynie is the Executive Clinical Director of Retina and Macula Specialists with multiple offices in Washington State. He graduated from Pacific University College of Optometry and completed a residency at American Lake Veterans Hospital in Tacoma, WA. He has served as a sub and principle investigator on research projects. He serves as adjunct assistant Professor at Pacific University College of Optometry in addition to directing an internship for 4th year Optometry students. He is a Fellow of the American Academy of Optometry and a member of the Optometric Retina Society. 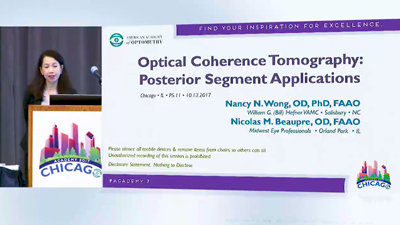 This course reviews morphologic characteristics of the vitreous, retina & optic nerve as defined by optical coherence tomography (OCT). A methodological approach is utilized to define diseases based upon OCT imaging. Utilization of OCT in the diagnosis and management of vitreal, macular, neuro-sensory retinal, sub-retinal and optic nerve diseases is examined and discussed. Dr. Nicolas Beaupre OD, FAAO is the clinical director of Midwest Eye Professionals, an optometric/ophthalmologic referral center outside of Chicago. He earned his Doctor of Optometry degree from the State University of New York College of Optometry. Dr. Beaupre completed his residency in Primary Care / Ocular Disease at the Veterans Administration Hudson Valley Health Care System in New York. With a passion for teaching, Dr. Beaupre runs the externship program at Midwest Eye, accepting 4th year students from ICO and NECO. He enjoys lecturing and is especially excited to be a part of the American Academy of Optometry in his hometown. Eight different case presentations will be shared that range from specific vasculopathies to retinal toxicity from commonly used medications. Specific ancillary diagnostic techniques such as MR imaging, specific blood markers and OCT-A imaging will highlight the need for on-going investigation and surveillance in certain cases in order to make a timely diagnosis and assure adequate treatment. Multiple case examples may mimic common eye conditions such as glaucoma and other conditions that affect the optic nerve and retina. Coordination of care with medical sub-specialties is essential to assure the best outcome possible and when indicated will be emphasized in this course. Joseph Shovlin is a senior optometrist at Northeastern Eye Institute in Scranton, PA. He is an alumnus (1980) of the Pennsylvania College of Optometry where he serves as adjunct faculty. He is a distinguished practitioner of the National Academy of Practice, diplomate and past chair of the Section On Cornea, Contact Lenses and Refractive Technologies of the American Academy of Optometry and past chair of the Contact Lens and Cornea Section of the American Optometric Association. A few of his consulting arrangements include the Centers for Disease Control and Prevention’s Workgroup on Contact Lenses and the scientific advisory committee of the Pennsylvania Lion’s Eye Research Foundation. He has served on the Ophthalmic Devices’ Advisory Panel of FDA (voting member and consultant) and the National Advisory Eye Council of NIH. He is associate clinical editor of Review of Optometry and clinical editor of Review of Cornea & Contact Lenses, section editor of Optometric Physician On-Line, journal board member of Optometry Times, Primary Care Optometry News and has served as a contributing editor for Optometry, International Contact Lens Clinic, Contemporary Optometry, Optometric Management and consulting editor of Contact Lens Spectrum. Within the Academy, he is currently the Board President and has served on the board of directors of the American Optometric Foundation. He has received several honors and awards including the American Optometric Association’s CLCS Achievement Award (2008), the Albert Fitch Memorial Alumnus of the Year recipient for PCO at Salus University (2011) and the Legend Award of the Contact Lens and Cornea Section of the AOA (2012). 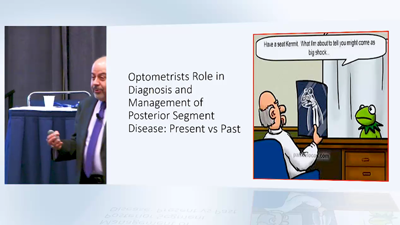 This lecture subject covers a variety of diagnostic technologies utilized in clinical practice and or research to study, diagnose and manage diseases of the posterior segment of the eye. These include imaging techniques such as different modes of optical coherence tomography, fundus autofluorescence photography, confocal scanning devices, wide filed imaging and angiography and multispectral imaging. Clinical use of other diagnostic tests such as dark adaptometry is discussed as well. Clinical examples are exhibited. Dr. Mohammad Rafieetary is a consultative optometric physician who has been is in practice at the Charles Retina Institute (CRI) since 1996. Dr. Rafieetary is a graduate of Boston University and has received his Doctor of Optometry from the University of Missouri-St. Louis. He has completed a residency in Primary Care Optometry and Ocular Disease at the Southern College of Optometry (SCO) and the Memphis Health Center. Upon complication of his residency in 1989, Dr. Rafieetary joined SCO’s faculty and served as an Associate Professor the Chief of Advanced Ocular Disease Service and at the Southern College of Optometry until he joined CRI. Dr. Rafieetary has received several awards including the SCO Faculty of the Year, American Diabetic Association’s National Achievement of Distinction Award, and the Tennessee Associations of Optometric Physician’s Optometrist of the Year. Dr. Rafieetary has served on the board of several professional organizations. He is a Fellow of the American Academy of Optometry and Optometric Retina Society. He is board certified by the American Board Optometry as well as the American Board of Certification in Medical Optometry. Dr. Rafieetary is published in numerous professional publications and lectures extensively on the subject of diseases of the eye with emphasis on conditions of the retinal and vitreous. Leo P. Semes, earned his OD from PCO and completed residency at The Eye Institute of PCO. Currently he is a Professor of Optometry at UAB. Dr. Semes has authored or over 230 articles, book chapters and posters. 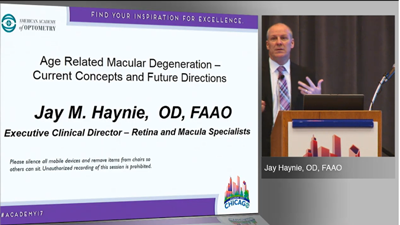 He is a fellow of the AAO, as well as an active member of the AOA. 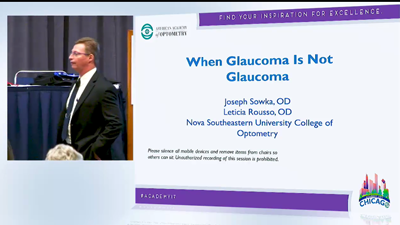 Dr. Semes is a founding member of the Optometric Glaucoma Society and a founding fellow of the Optometric Retina Society. Recently, he was recognized as one of the 50 “most influential individuals in eye care” by Optometric Management magazine and received the Educator of the Year award (2015) from the Alabama Optometric Association. Recently he was recognized with the Dean’s Distinguished Service award (2016). Leticia Rousso graduated from the University of Florida receiving a Bachelor's degree in Health Science. She received her Doctorate of Optometry degree at Nova Southeastern University. She continued her education at Nova Southeastern University by completing an intensive residency program specializing in ocular disease. She is currently an instructor at Nova Southeastern University College of Optometry. You will gain a comprehensive review of AMD and the differentiation of “dry” and “wet”. 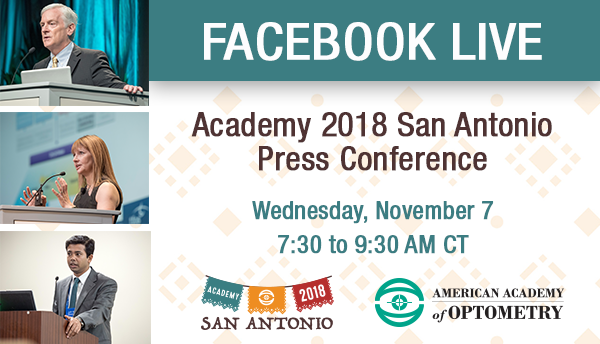 You will learn the results of the latest clinical trials and an update on new technology that have changed the perspective on how patients with macular degeneration are managed. There has been an explosion of new options that you will be able to implement immediately as well as update you on future treatment modalities.